Forms. You can’t live with them and you can’t live without them. Chances are that there are forms on your website right now? The issue with the forms on your website is that people “actually” have to reach out to your pages to actually enter data into it. If you ask me, that’s a tough ask. One, your visitors have to arrive at your site. Second, they’d have to navigate to the page your forms are on (contact page?). Third, they actually have to enter information into your form. At a time when it’s hard enough to get someone’s attention, you’ve already done the remarkable job of getting people to your website. But it’s getting to the forms and filling it part that you’ll begin to lose them. Asking visitors to fill up forms is fine. But you see, every bit of resistance visitors feel before filling up the form is getting them closer to leave your website, let alone fill up the form. Assuming that your visitors are motivated enough to fill up your forms, it’s a challenge to even find the form in the first place. WordPress forms are usually controlled by the design of themes and plugins you’ll end up using. Given that the way your WordPress forms look are controlled by the design of the theme, form layouts are not exactly a priority for designers. They don’t care about how your forms should look. Meanwhile, it’s costing you pretty penny. Most WordPress themes and WordPress websites don’t give you the ability to create standalone, dedicated landing pages for forms. Form pages by WPForms is a brand new feature by the awesome folks at WPForms to allow you to create specific, laser-focused, branded, and distraction-free web pages with your powerful and customizable WPForms on them. On the web, visitors can be easily distracted. Links, buttons, images, and anything else that could make them click on and get away or even momentarily distracted is enough to kill conversions. Distraction-free design is a core principle of conversion-centric design. The more distractions you have, the lesser the rate at which a page converts. Taking cues from conversion-centric design, WPforms now allows for the creation of dedicated landing pages where your actual forms can live. 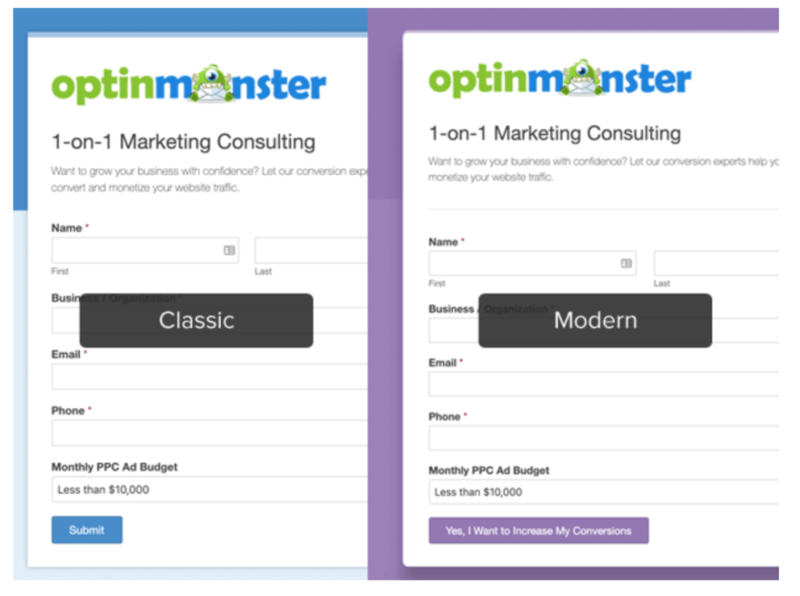 At the moment, your dedicated landing pages for forms come with two design templates: classic and modern. Both the versions of Form Pages allow you to completely customize the look and feel of your forms. The classic version of the Form Pages allows you to create as much of a form page that your Google forms can be. Meanwhile, the modern template that ships with Form pages by WPforms gives you a lot more flexibility when it comes to designing forms. Shipped with over six predefined color options, you can combine the form styles as you want to. If you are the experimental type or if you’d like more control, you can also build a custom color scheme by choosing a single color (maybe your brand’s main color). WPForms will then generate other colors and gradients to automatically build your color scheme — without you ever having to rack your head. When you create a Form Page with WPforms, you are essentially creating a form on a dedicated page, with its own link. Remember the movie series The Fast and The Furious? Each time the characters get into a drag race, at some point during the race, they’d flick a switch that releases Nitrous Oxide to give them a huge kick in terms of speed? Creating your Form Pages with WPForms is just like flicking that switch on. As you go about creating your forms with WPForms, you have an option to check an option which says “Enable Form Page Mode”. You’d normally begin creating forms with WPForms, except that while you are at it, you can get all Dominic Toretto whenever you want to. Flick that switch on, and you’ll get right down to creating the exact kind of form you need, complete with options for color, style, and orientation. This is no ordinary form with a few field labels and field names that you’ll build. With WPForms itself and Form pages by WPForms, you can get as nerdy as you’d like. Depending on your use case for form pages and forms themselves, WPForms ships with a lot of powerful add-ons and plugins that you can use. For instance, you can build custom form landing pages and combine it with other powerful WPForms features such as smart surveys, conditional logic, payment integrations, marketing integrations, user registration, form abandonment technology, and so much more. Use Form Pages by WPForms and the next time your visitors land on these dedicated landing pages for forms, there’s nothing to be distracted with. There’s only that hyper-targeted, critical, and result-oriented action you want your visitors to take, ready with a form to gobble up the information you need for your business. So, whether you need your visitors to sign up for a consulting gig, provide you with information to allow you to complete a paid gig, login to register for a membership, provide you with details for you process their information, or to fill out a survey — your focused forms are all primed up to deliver. With Google forms, you can create forms. That’s it. Apart from a few ways to add color to your forms, you don’t get much. 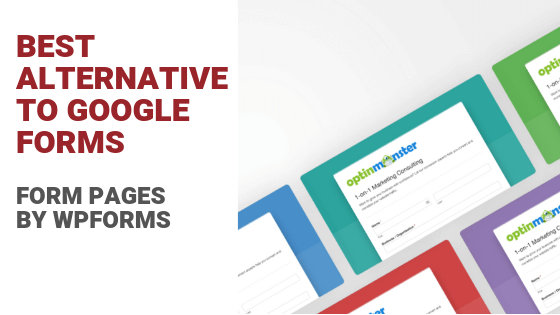 WPForms itself and especially by using Form Pages by WPForms makes for an exceptional Google Forms alternative for WordPress. 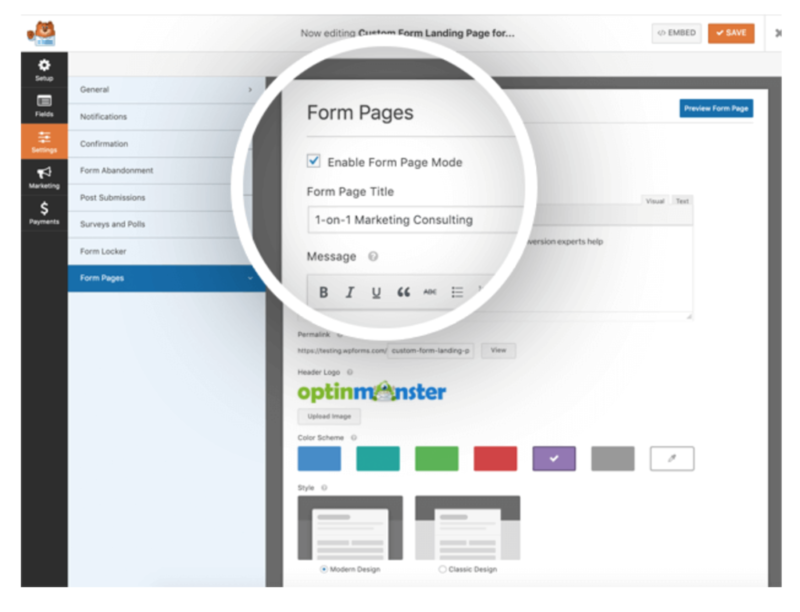 Lead Generation: Did you know that you can directly use form pages to generate leads for your business? Form pages by WPForms are just like landing pages with superpowers to help you build an email list — by creating a webpage dedicated solely to signing up. Consulting Questionnaires: If you are a consultant, you are probably charging for your time. In that case, you can’t be possibly asking questions while you are on a paid phone call (or Skype call) with your customers. A better practice is to collect all the information you need prior to the actual paid call or even a free 30-min consulting discovery call. Your Form Page makes for a great start for your information collecting workflow or for the initial discovery call. Collect testimonials: We all know just how important social proof is, right? Make it easier for yourself to collect testimonials from your customers regardless of what you are selling — from physical products to digital downloads; from online courses to coaching or consulting. Surveys: Need to ask questions? Want validation for an idea? Want to launch a customer satisfaction survey? Launching a direct, branded, and a straight-forward webpage is a no-brainer. 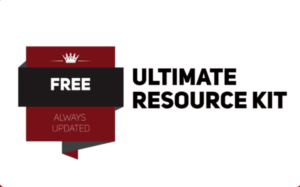 Membership Sites: Running a membership site? Create a form landing web page on your site with user registration and login forms, making it easier on people to sign up and log in to your site. Events: If you need people to RSVP to an upcoming event, whether it be a business conference or a child’s birthday party, add your invitation and RSVP forms to web pages and invite people to reply. Check out the brand new feature and add-on — Form pages by WPForms — to boost your form conversion rates and make results happen.